Yes, Coconut Oil is Paleo! Coconut oil is an edible oil extracted from the meat of coconut. It has been a staple food in the Paleo world. It is about 90 percent saturated, 6 percent monounsaturated and 3 percent polyunsaturatedfats and is almost solid in room temperature. Most of the fats in coconut oil come from the medium-chain triglyceride (MCT), a saturated fat that does not require bile acids for digestion which passes directly to the liver. This means that coconut oil is easily digested and absorbed b y the body. Medium chain triglycerides are high in lauric acid which has antifungal, antibacterial and antioxidant properties. Coconut oil has been a great source of fat calories. It is stable even under high heat, enabling long shelf life. It can be used for cooking, home remedies and as skin care products. Coconut oil is extracted through dry and wet processing. The quick drying process requires the use of minimal heat, be it fire or sunlight, and press the oil out of the coconut. The wet process or wet-milling on the other hand uses coconut meat. With this method, the oil is extracted from the coconut meat without drying it first. The oil is then separated from water using methods such as boiling , fermentation, centrifugal separation or enzyme. There are 6 varieties of coconut oil that are available in the market. Pure Coconut Oil – It is the most well known coconut oil extracted from dried coconut kernels known as copra. It is pure, unrefined and without additives. It is commonly used for hair and skin care. Refined Coconut Oil – Also known as RBD (refined, blanched and deodorized coconut oil), this type is obtained by chemically and mechanically refining, bleaching and deodorizing the crude coconut oil to make it thin, odourless, leaving only pure saturated fats. Bleaching is not a chemical process but rather a filter process to remove impurities. Organic Virgin Coconut Oil – This type is typically virgin coconut oil produced from organic coconuts. This is the best and purest form of coconut oil but is rare in the market. Extra Virgin Coconut Oil – Among all the varieties of coconut oil, extra virgin coconut oil is the healthiest and most controversial as there is no standard for the virginity of coconut yet. 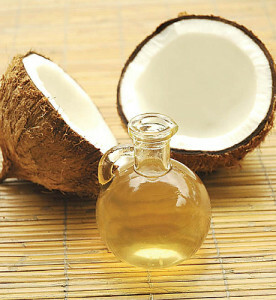 Coconut oil is a great source of fatty acids which are thought to minimize the risk of heart diseases. Coconut oil can help normalize body lipids and protect the liver for damages caused by alcohol or medications and gall bladder infections. Coconut oil is rich in lauric acid which has antibacterial, antifungal and antioxidant properties. The antibacterial and antifungal properties of coconut oil are good for the immune system. The lauric acid in coconut oil is converted to monolaurin which has been proven to help deal with viruses and bacteria causing influenza, herpes, HIV and cancer. It promotes healing and repair. Coconut oil is energy boosting. Coconut oil can be topically applied to protect the hair from damage, promoting healthy growth of hair. Coconut oil can be used as massage oil for skin, leaving it moisturized. It helps in treating skin problems such as psoriasis, eczema, dermatitis and other skin infection. Due to coconut oil’s anti oxidant properties, it can help in preventing premature aging. Coconut oil is very stable and can be used for high-heat cooking such as stir frying, sautéing and roasting. It also adds sweetness to food. Not All Coconut Oils Are Created Equal! Some coconut oils are better than others. We already discussed the varieties of coconut oil available in the market. Apparently, the more processed the oil, the less benefit you can get from it. In the Paleo diet, it is recommended to choose the unrefined, virgin form. Some refined coconut oils are treated with chemicals and processed in very high heat, therefore compromising its quality. What Experts Say About Coconut Oil.. Is It Paleo? Paleo Leap. Coconut, an optimal source of fat? Paleo Grubs. Is Coconut Oil Good for You? Good Food. Coconut oil: paleo superfood or health fad? Stupid Easy Paleo. Coconut 101: Everything You Need to Know About Coconut. Living Paleo. Health Benefits of Coconut Oil.